you should get a dragon tattoo, riiiiiight there. Always good to see David Fincher doing more intense, darker material like this. He excels at it. And there are definitely some dark, hard-to-watch moments here. If you can handle those moments, and you like a good detective story, then you should enjoy this one. For some reason, I like seeing characters piece together a puzzle. That’s one of the reasons I liked Fincher’s Se7en, and it’s one of the reasons I liked this movie. It’s not quite Se7en, but it’s definitely worth a watch. I’ll hop on the Rooney-Mara-was-awesome bandwagon as well. She is quietly menacing, yet vulnerable at the same time. Luke: Pessimism is just a higher form of optimism. If you expect nothing from people, then you go through life being pleasantly surprised. A couple years ago I saw a movie called The House of the Devil. It was a sort of throwback style horror movie, well directed by a guy named Ti West. When I noticed his name was attached to another horror movie, The Innkeepers, it caught my attention. While this movie doesn’t quite achieve as interesting of an atmosphere as The House of the Devil, it still succeeds in being enjoyable for about the same percentage of the movie as that earlier Ti West effort. Unfortunately, both suffer from weak endings. I had never heard of Sara Paxton before, but it looks like she’s been around for quite a while, with earlier roles in a lot of kid/teen stuff, but more recently in grown up roles like in The Last House on the Left and Shark Night. In this movie, she’s kind of a geeky loser who has resigned herself to a life of menial jobs, like the one she currently has at the Yankee Pedlar. I liked her performance a lot. It’s different, and in a movie with a story that isn’t exactly original or attention grabbing, you need interesting characters. Paxton and Pat Healy do a nice job of creating those characters. Less interesting is Kelly McGillis as an aging actress who has turned to the world of spiritual healing. She has a few good moments, but seems more like just a plot convenience than a fully formed character. My main complaint about the movie would be that at the end, I was left thinking, “…that’s it?” There’s not much closure or resolution to this one. It’s simply a haunted house story with more laughs (intentional, thankfully) than scares. It almost feels like a case where there was a more complex original ending that didn’t make it to the final film. Instead, they just went with something simple, and almost completely unsatisfying. Which is a shame because much of the film leading up to that had me interested in where it was going. you didn't read past the first page of the script before you agreed to do the movie, did you? Moriarty: People have an innate desire for conflict. So what you are fighting is not me, but rather mankind. War, on an industrial scale, is inevitable. I’m just supplying the bullets and bandages. Sherlock Holmes (Downey Jr.) enlists his newly married friend Watson’s (Law) help once more as he attempts to discover who is behind a series of bombings and what their motives are. Well, it’s just over a week since I saw this, so I might not remember it very well. Actually, if I were writing just a once sentence review, I think that would be it. This is the kind of movie that goes into your brain, entertains it as it rattles around in there, then exits as quickly as it came. In that regard, it’s a lot like the first movie in the series. I honestly can not remember what the plot to that one was. It was a sea of British accents, grey scenery, booming music, big action sequences, and witty banter. I do know that it had Rachel McAdams in it, which is unfortunately not true for most of the sequel. But hey, the rest of the stuff I listed was still there in the new film. Plus, for now I do remember who the villain was, which is something I can’t say about the first movie. Jared Harris is pretty good as Holmes’ arch nemesis, Professor Moriarty. Not an all time great villainous performance, but good enough. Speaking of supporting players, Noomi Rapace was also good as a gypsy whose brother might be involved in Moriarty’s nefarious plot. She’s not given a huge amount to do, but she does have a certain presence. When she’s on screen, you notice her. I thought some of Downey and Law’s banter was a bit tired. They didn’t seem all that thrilled to be delivering it, and I wasn’t all that thrilled to be hearing it. There were a couple of funny and inspired moments between them, but for the most part, that relationship felt a little flat. We don’t come to these movies for just the witty dialogue though. We want to see a good detective story. We want to see Holmes’ calculating brain at work, whether it’s analyzing a crime scene or planning to defend himself against three thugs in an alley. There’s plenty of moments like that, though I didn’t think the overall mystery was handled very well. To me, the movie didn’t bring the audience along for the ride enough. Some aspects are explained so quickly that there’s no mystery to it at all, which is no fun. Meanwhile, in other ways I felt a bit lost. I think people want to be able to put themselves in Holmes’ shoes and play detective as the movie rolls along. Unfortunately, I don’t think this movie provides the audience with the ability to do that. Thus, we sit back, watch, feel reasonably entertained, then move along. I’m sure by the time the next sequel comes around, I’ll have forgotten what happened in this one. Maybe that’s their goal though, as filmmakers. That way they can just keep making the same movie over and over and nobody will ever notice. Harry: Why are you following me?? Martin: I’m not following you, I’m looking for you. There’s a big difference. 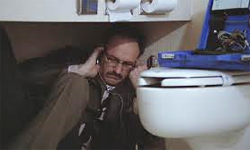 Harry (Hackman) is a lonely, somewhat paranoid free-lance surveillance expert working in San Francisco. When he starts to suspect that the recordings he made of two people might result in their murder, he becomes hesitant to turn the tapes over to the company that hired him. As he delves deeper into what this cryptic conversation he’s recorded might mean, he also worries about what lengths the company might go to in order to gain possession of those tapes. This is one of those under-the-radar sort of classics that I’ve heard a little bit about here and there and only finally got around to watching yesterday. While it didn’t bowl me over with how amazing it is, it’s certainly a very solid film, anchored by a very nice, subtle performance from Gene Hackman. I’m used to seeing Hackman in roles where he plays more boisterous, and often villainous, characters. It’s nice to see him playing a quieter sort of every man. He does it quite convincingly. Also convincing was a young Harrison Ford as Martin, the shady assistant to the man that hired Harry in the first place. He’s creepy, but you’re just never quite sure how wary of him Harry should be. It was also nice to be surprised by a movie. I’ll admit, I did not see the ending to this one coming. They get you so wrapped up in Harry’s paranoia that you forget to try to figure out what might be going on. And that’s the sure sign of a quality movie – the twist ending isn’t the whole focus of the movie. The focus of the movie is the question of what moral responsibility a person in Harry’s profession has. As he says, he just gets the information. What his employers do with it isn’t his problem. But, one can only shut off one’s humanity for so long. When sympathy for the client starts to creep in, concern is soon to follow. This is the sort of movie that I could imagine (with a cringe) getting remade nowadays, directed by Tony Scott, hyper-edited, starring Denzel Washington, and ending with a car-chase-shoot-out sequence. Thankfully Francis Ford Coppola didn’t see a need to direct it that way. Instead, the tension builds subtly around you until you end up just as frustrated and thrown by the final events as Harry is. Those who surveil are likely to end up being surveilled. This movie is in Spanish, with English subtitles. Laura (Colucci) and her father, Wilson (Alonso), plan to fix up their old home in order to sell it. Shortly after arriving there in the evening, Laura begins to hear noises. Her father goes upstairs to investigate…and then things get scary. If you’ve read my blog closely over the years, you’ll know that I have a great fondness for Alfred Hitchcock movies, and for those who try to create a tone in their movies that is reminiscent of Hitchcock. So, when I heard that the interesting thing (or gimmick) about this movie was that it was filmed “in one continuous shot”, like Hitchcock’s Rope was meant to seem to be filmed, I was intrigued. Unfortunately, there’s not much to this one beyond that gimmick. And like Rope, I’m sure this movie wasn’t actually filmed all in one shot either. I haven’t researched that to back up that claim, but there are pretty clear moments where easy edits could be made. Still, it’s an interesting way to film a movie. It’s like having your cake and eating it too, in that you can give it a first person, Blair Witch type feel, while also having music and artsy cinematography. It does make you feel like you’re along for the ride with Laura as she creeps around the dark, creaky house. But, that also presents a problem, as you start to learn why editing can play such an important role in a movie. Usually you’ll see somebody start to walk up stairs, then we cut to the top of the stairs as the character reaches the top. Not here. In this movie we follow Laura up every step…around every corner…through every door…around every room. And it grows tiresome. It grew even more tiresome when, about halfway through, I figured out exactly where the movie was taking me. At that point, the stuff that is supposed to be tension building just becomes tedious. Really, there’s only one good scare in the movie, and it’s during another call back to a Hitchcock scene. This time it’s an homage to the finale of Rear Window. There just wasn’t enough original content in this one. It’s well made, and well acted, but aside from the continuous shot idea, everything seems recycled from other movies. If you’re not going to have anything new, at least try to make the old stuff more exciting. Just don’t go into old, spooky houses with no electricity. c'mon pal, can't we just get beyond thunderdome...? Craven: You had better decide if you’re hanging on the cross, or banging in the nails. Thomas Craven (Gibson) is your average movie detective. He’s single, has a daughter he doesn’t see much of, is generally referred to by his last name only, and he’s really good at fighting and shooting guns. Unfortunately, his daughter, Emma (Novakovic), is gunned down right in front of Craven, sparking him to launch an investigation into why. Pretty typical fare here, but probably done a little better than usual. There’s nothing much new on display, except for maybe the details of the situation that Emma was mixed up in, which still seems to be revealed in a rather formulaic way. In fact, at times I was wondering why Craven wasn’t putting all the pieces together a little faster. The best thing about the movie is probably the character of Jedburgh (Winstone). He’s sort of an ambiguous hit man hired to “clean up” the situation, but instead investigates it first in order to use his own moral code to decide who he kills and who he spares. At least I think that’s what was going on. It was late and I was pretty sleepy while watching this, so I could be off in my description there…but he’s still a cool character, whatever his function. I don’t know if it was the way it was made, the performances, or the story and writing, but something in this movie kept my attention all the way through. Despite it all seeming so familiar, it had sort of…well…an edge to it. A seriousness that I appreciated. All these characters are walking a tightrope between light and darkness…and life and death. You don’t know who exactly is going to end up on which side by the end of the movie, and that’s what keeps it interesting. Mel Gibson is alright, but not overly great, in a role it feels like he’s played before (maybe a mix of Payback and Ransom). His increasingly gravelly voice is especially appropriate for a weary, depressed cop, though at times it sounds almost painful for him to even get an entire sentence out. It’s really Winstone, Huston, and Young as the possible villains that steal the show. Huston and Young in particular will crawl right up under your skin with their smarmy attitudes. Still, despite being well made and holding my attention, this is the kind of movie that I would call highly forgettable. You might have a good time watching it, but then later you’ll have trouble even remembering the characters and the plot (see 3 paragraphs up). I think this is mainly due to it being a standard revenge plot, where only the core mystery is what’s different from other films of its type. Basically you take that basic revenge framework and plug in whatever story you can come up with to provide motivation for the characters. As long as you can keep thinking up stories, you can just keep churning out revenge flicks. It might not always be a good idea to Get Milk. Doug: You look contemplative…what are you thinking about? Carlos: Well, uh, nothing man…I just want to ask you if it’s really cool if I take Rachel to the Star Trek convention tomorrow. Carlos: I mean, I know she’s your ex-girlfriend and everything. Doug: I’m not bothered by it. Carlos: I don’t know, I just didn’t want you to think we were going on a date or something…I don’t know, the whole thing just makes me uncomfortable. Doug: I’m totally fine with it. And you guys are dorks. After dropping out of college, where he was studying forensic science, Doug (Lankenau) moves in with his sister and gets a job in an ice factory. It’s basically a dull, uneventful life he leads until one day his ex-girlfriend goes missing, and Doug must employ some of the skills he’s learned in order to find her. Have you ever wanted to be really good at something but not willing to put enough work into it to succeed at it? I think that’s a feeling that a lot of people can relate to, so already we have a connecting point to this movie. Specifically to Doug. He wants to be Sherlock Holmes. He loves Sherlock Holmes. But when it comes to actually taking the steps to be Sherlock Holmes, Doug isn’t so able to follow through. He dropped out of college where he was learning how to be a detective, and then when he’s faced with an opportunity to actually solve a mystery, he’s reluctant to even get involved. He has also moved in with his sister, Gail (Dunn), which could point to a state of arrested development for both of them. They both seem to want to escape from a certain sense of apathy, and they might be each others best hope and worst enemy as far as that is concerned. Their relationship was a little odd to me…borderline uncomfortable at times, but thankfully never venturing into creepy territory. They definitely work well together, as characters and actors. Lankenau and Trieste Kelly Dunn both give very good, believable performances, as do the other two main actors – Raul Castillo as Carlos and Robyn Rikoon as Rachel. The friendship between Carlos and Doug is very natural and is given time to develop in the first half hour or so of the movie. In fact, that first section of the movie is devoted almost entirely to character development (I love that Carlos is really into Star Trek). Though, there are a couple of little clues to the upcoming mystery strewn about. What is probably most surprising about this movie is how funny it was. The dialogue is witty and well written, once again in a believable way. It’s not about writing set-ups for jokes and then delivering punchlines, it’s about writing witty and odd things that sound like what people would actually say within real conversations. The comedy and mystery elements are balanced very well throughout, not unlike the way Hitchcock used to balance them. In fact, we get another Hitchcock element here as well – a MacGuffin in the form of a briefcase that drives the last half of the movie. Any movie that gets me in the mind of Hitchcock movies probably has some good things going for it. My only real disappointment (aside from Carlos seeming to disappear from the movie two thirds of the way in) was at the very end. Without giving any spoilers, I’ll just say that you should go into this one knowing that, when the credits roll, you might find yourself saying, “wait a second, it’s over?” That cut to black was a little too sudden for me, but that slightly bitter aftertaste wasn’t enough to erase the memory of the good film that preceded it. I like seeing characters find a purpose and focus in their lives. And even though this specific situation won’t last forever, there’s hope that this renewed sense of adventure will propel Doug and Gail into a future more closely resembling what they probably dreamed of as kids. A future where they aren’t afraid, and too apathetic, to be the people they want to be. Be careful what you throw away in hotel trash cans. typical day in L.A. traffic...? 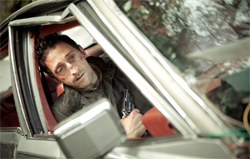 A man (Brody) awakens, pinned in a wrecked car in the bottom of a remote ravine. He has no memory of who he is or how he got there. As he struggles to survive, clues to his identity start to emerge. Do you like Adrien Brody? Can you stand to watch him for an hour and a half? Because if you can’t, I’d suggest you just skip this one. Basically it’s like Cast Away, but without the Helen Hunt bookends. I happen to like Adrien Brody, so I was fine with him being the main focus of the movie. Of course, I was also pleasantly surprised when Caroline Dhavernas (of Wonderfalls) showed up as the mysterious woman that Brody keeps having visions/dreams about. Does she have something to do with the events that got him in this predicament? And what about the dead guy in the back seat?? Going any more in depth about the plot would be giving away too much. But, I will say that I found it a tad bit predictable. There’s really only two directions it could go, one more likely than the other. Still, the movie did manage to throw in a couple of little twists that kept things interesting. It’s Brody that drives the movie, though. He just seems to have a way, a certain look he can give, that automatically makes me feel sympathy for him. Even when you’re not exactly sure how you should be feeling about his character, you’re still rooting for him to find a way to crawl out of that ravine. Of course, he’s so badly injured that it’s hard not to feel sympathy for him. In addition to a broken, mangled leg, he seems to have possibly broken his nose, and when you’re Adrien Brody, that’s a pretty big deal. It’s all filmed up in the Pacific Northwest, in the Vancouver area I believe, and the scenery certainly adds to the appeal of the movie. The director, Michael Greenspan (in what seems to be his first full length feature), has managed to make this mountainous forest both beautiful and isolated in a sort of creepy way. Though it doesn’t seem like THAT bad of a place to get stranded. I mean, at least it’s not the desert or in the snow. This place has pretty trees, rain water to drink, worms to eat, and deadly mountain lions. What’s not to like? Aside from the deadly mountain lions. While this isn’t an instant classic, and a few aspects of it could have been handled better, it’s a fun what-would-you-do type situation, as well as a good little (though predictable) mystery. I was a little annoyed by how long it took him to actually try more methods of extracting himself from the car (3 days to finally try to pry the door open?? ), and I wish there had been a few less plot conveniences, but all in all, I had a pretty good time watching this one. Bobby: I don’t get wrapped up in a bunch of stuff I can’t have. Johnny: Relax, it’s just for fun, bro. Bobby: That’s not fun. That’s propaganda, man. All those Madison Avenue types telling you how to live your life. Fast cars, hot chicks…Reese’s Pieces…Gucci…Werther’s Original. I don’t buy into that bulls***! When highschooler Craig (Gilchrist) finds himself seriously contemplating suicide, he checks himself into a hospital. He’s admitted to the psych ward, but due to renovations, he must stay in the adult psych ward. This is a watered down, sugar coated sort of story about people dealing with some fairly serious mental issues. I’m a little torn on this movie, because it was mostly entertaining, but it’s also distractingly unrealistic in its portrayal of many of the issues at hand. At least I think it is. I’m no expert in the area of mental health, but I’m guessing schizophrenia isn’t normally a comedy relief provider in the real world. It’s predictable and simplistic, but at least Galifianakis, as Bobby, is there to partially save it. He’s funny and likable, and honestly I think I’d rather have seen a movie about his story instead. Keir Gilchrist does a good enough job too, but his character wasn’t as interesting as Bobby. Speaking of uninteresting characters, Noelle (Roberts) is given hardly any development at all. I kept waiting to hear more about her life, but that info never came. But she’s really just there to help turn Craig’s life around anyway, so I guess that doesn’t matter so much. It’s funny, I liked the attempts at a fun, stylistic approach to making the movie, and as I mentioned before, Galifianakis brings it up to another level. Still, I can’t help but think that one could still make a funny movie while showing the darker side of some of the illness on display here. It doesn’t have to get into Girl, Interrupted territory, but a little more edginess wouldn’t have hurt. Chicks dig guys with mental problems.